Today, I’ve noticed that the internet is filled with cries of “Happy International Steampunk Day!” While I am all for the celebrating of the genre that I love, I had to wonder about the reasoning behind choosing June 14th to be ISD. 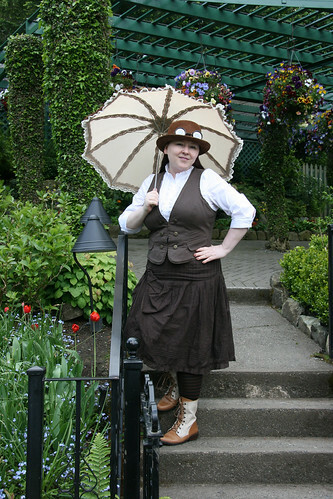 After all steampunk clothing is generally layered and quite warm. When looking at dates for Steamcon, we tried very hard not to schedule it in an extremely warm time of year so that our attendees could go all out and not roast. 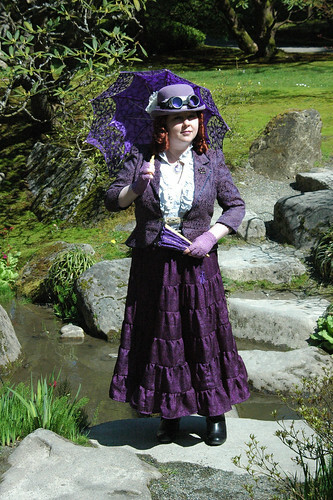 My steampunk ensembles tend to include boots, tights, gloves, hats, wigs and then several layers of clothing. Sweating is not very dignified and so we do avoid it, if we can. I did a little digging and I still cannot figure out whose knuckle headed idea it was, but I did find out why they chose this particular day. It is H.G. Wells’ birthday. Mystery solved. Although, if you wanted to choose a birthday to honor steampunk, why wouldn’t you choose Jules Verne’s birthday? After all, he is even more associated with the genre and his birthday is February 8th! That is a much better time of year for steampunk regalia! And if you will notice there is not a fabulous Google doodle for the day like there was for Monsieur Verne’s birthday. I am not sure who to petition about this matter, but I would like to see this day re-scheduled to February 8th. 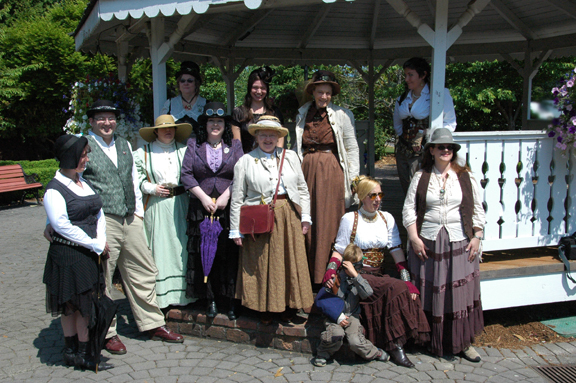 I am not even going to discuss the “Worldwide Strut Your Steampunk Stuff Day” that is proposed for July 10th. Aside from a terrible title, it is once again an uncomfortable time of year to choose. Not that I won’t join in, but it will take a bit of work to find the right clothing. Summer steampunk events are already the bane of my existence, but I will do what I must. So, I will stop my whining and go back to my steampunk task filled day. No outings planned and I have no voice so it’s for the best. Plenty to do though and almost all of it genre related. I hope that you enjoy yours in whatever manner suits you. Happy Birthday Mister Wells! Hold the presses! Wells wasn’t born on this date. He was born on September 21st?! Okay, then why the heck is this IDS? it makes absolutely no sense at all. I am baffled. Can anyone tell me why they chose this stupid date then? Today I have a mild head cold and have lost my voice, but I am determined to finish a few things. My day was brightened by finding out that I was singled out on my other blog site for what they call the “Lens of the Day” for my article Dressing Steampunk. It’s nice to get recognition and it’s helping a lot of new folks find out about steampunk as well. Yay! 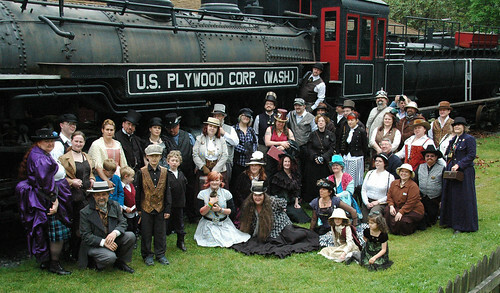 On Saturday a group of us from the Seattle Steamrats went up to Snoqualmie and rode the train. Naturally, we dressed up for the occasion. You can see the entire gallery here. Afterwards many of us went to the Woodman Lodge for lunch. The food was great and the staff was very accommodating of our large group. I highly recommend the place if you are every in the area. It was a wonderful day even if I did lose my voice. The summer months in the Pacific Northwest tend to be busy due to the possibility, mind you not definite, chance of nice weather. This summer is looking to be quite busy, so I thought I’d give you a peek at my schedule in case you might be able to join in the fun. Click the links for full details. 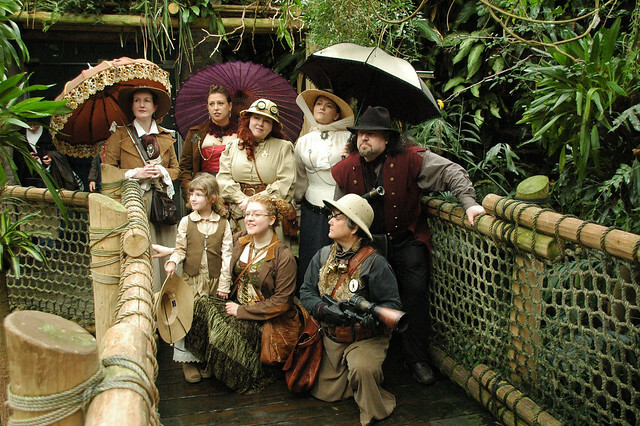 June 18th – Portland Summer Solstice Circus and Ball – I am going to be giving an “Intro to Steampunk” talk. I’ll add details as I get them. July 1-4th – Westercon – Okay, not quite in the target area, but steampunk themed and the Foglios are guests! I will try to update the one’s missing data as soon as I can, but you can mark your calendars in the meantime. There may be more additions as well. I hope you can join us. There is also a regular Monday meet-up in Seattle and several others around the are, which I occasionally manage to attend. Feel free to join the Seattle Steamrats group on Facebook if you are in our area and want to keep up on all the events.